Have you attended a conference recently that transformed the way you worked after returning to your office? Conferences are a great way to network with others, hear salient ideas from thought leaders, and be inspired by colleagues from any number of disciplines. This year I was fortunate to attend six conferences, one of which, was the UW-Madison Distance Teaching and Learning Conference held this summer in Madison, Wisconsin. Although there were many great insights and lessons learned at this conference, I especially enjoyed the sessions on video and interactive video content and their relevance in today’s training and educational world. For example, James Moore from DePaul University shared take-aways from video best practices and educational videos. He explored how you can create engaging video for instruction using ScreenFlow, Screencast, or Camtasia. He encouraged content creators to use content from open sources. Referencing Richard Mayer’s multimedia principles, he underscored the importance of applying several of these principles to video as well. To help with poor audio, he suggested using a pop filter as a best practice to minimize audio distractions. In terms of recording video on mobile devices, he reminded those who videotape themselves to turn their phones sideways before recording video. Watching videos in portrait mode requires the brain to scan vertically, and it’s not conducive to the way we normally view the world. Additionally, because many people are uncomfortable when presenting in front of a camera or often look quite scared, Moore suggests creating bullets on the Teleprompter for on-camera talent so they are not tempted to read verbatim. This helps them to not be as tied down to the teleprompter and hopefully, relax more. Additionally, Moore emphasized that many more viewers are watching video only on their phones, especially millennials, so realize your videos will most likely be viewed on small screens. Matt Pierce from TechSmith was another presenter at the conference who also discussed the use of video for learning. According to a 2016 study conducted by TechSmith, participants watching instructional and informative videos often stopped watching the videos after around one minute, and their main reasons for stopping the video were because they were bored or it wasn’t providing them what they were looking for generally. This raises the bigger question of the need to continually explore how to engage viewers through video. For those who wish to integrate content with video, there are some applications that allow you to create video content and then pause and allow students to respond in a comment or a question box. Learners may select an answer and then receive immediate, corrective feedback. As we know from multiple research studies that show the results of the testing effect, frequent quizzes that test recall often and give corrective feedback are essential for learning. John Orlando from Northcentral University recommends a variety of interactive content applications which include: EDpuzzle; dot storming; Videoant; Thinglink; and Touchcast. In terms of actual video production, Pierce suggests that if you do make a mistake while recording video to simply speak the line again. This is a more efficient way to record, rather than starting completely over as a new “take.” In post-production, the error can be edited out or smoothed over with a transition or cut-away clip. There are also ways to underscore your video productions and cue the viewers as to the most important content and parts of your video. For example, you can use a verbal signpost such as “If you hear nothing else, remember this . . . ” Phrases such as these alert the listener to pay extra special attention. The best take-away from conferences, of course, is the ability to return to the workplace and apply something new. And hopefully, you and your organization will reap the benefits of transformation somewhere along the way . . .
What is one of your key take-aways from professional development or conferences you’ve attended this year? When I was in the third grade, my father visited our classroom dressed up as Benjamin Franklin. Portraying Ben as himself, he taught the eager third graders about Ben’s work in colonial times, highlighted some of his American accomplishments, showed us an electricity trick, and shared a few related jokes. It was thrilling for us all, and of course, I still remember it like yesterday. 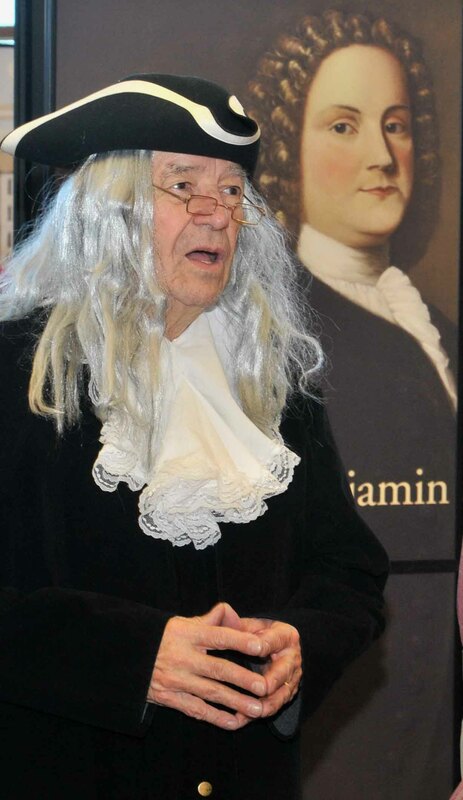 Throughout his life, my father continued to portray Ben Franklin for various events, cruise gatherings, adult social groups and community library functions over the years. The attached photo shows his last portrayal and public appearance as Benjamin Franklin. After my father passed away, my siblings and I were clearing some of the estate only to find the original thank you letters written by my third grade classmates all those years ago. In the letters, students thanked Ben for his visit, shared what they enjoyed most, and invited him back again. Now in honor of my father and his deep respect for Ben’s contributions to America, I continue the tradition by dressing up as Mrs. Abiah Franklin (Ben’s mother) and giving presentations for elementary school classrooms. In character, Abiah Franklin also shares about colonial life, her 17 children of which Benjamin was her youngest son, and some of Ben’s many accomplishments. It’s extraordinary how willing children are to move with you into make-believe. There’s definitely a part of them that recognizes at once that someone is dressed up, and how could a citizen from the 18th century suddenly appear before them in 2015. Yet amazingly, by the end of our time together, the students are calling Abiah “Miss” and asking questions that prove they, too, have seamlessly entered the world of make-believe. This was evidenced, in particular, by one young lad who took it upon himself to carefully explain how indoor lighting worked and that the light above was actually not candles on the ceiling after all. Questions from students during Abiah Franklin’s presentations are always entertaining. I receive questions like “What was it like living in the colonial days?” and “What was Ben like as a boy?” and “How did you ever get along without WiFi?” – until, of course, they realize Abiah doesn’t know what WiFi is. Eager to assist, students also work hard to explain to me what a camera is – only to discover that an explanation is much more difficult than they expected. As a parting souvenir and tangible reminder of the visit, students each receive fake $100 bills with Ben Franklin on them. Without a doubt, Ben’s accomplishments were many and the lending library, fire stations, national postal system, police force, and University of Pennsylvania as an Academy–to which he played a major role in founding–all still stand today. It’s hard to imagine that contributions from one life still exist over 300 years later. His invention of bifocals also still exist today in various forms, and in his time, his invention of the Franklin Stove improved heating and efficiency with less smoke. Of course, we’re all aware of his famous experiment proving that lightning is the same as electricity. Additionally, some of his published witticisms like “a penny saved, is a penny earned” from his 13 colonies’ best seller Poor Richard’s Almanac still circulate today. Overall, it’s not just children who can benefit from Ben’s example and inspiration. True, he wasn’t perfect and had relationship challenges of his own making. However, he did strive to constantly improve himself by following 13 main virtues. Additionally, his philanthropy inspire us all to raise the bar. If he were here today, he would encourage us to observe and perceive any needs in our present communities, seek out ways to improve them, and help others when we can. So Benjamin’s legacy lives on, as do some of the early documents he helped to draft like the Declaration of Independence and the United States Constitution. Although he was clearly many things: a diplomat; an inventor; a printer; an entrepreneur; and a writer. He was also, most certainly, an American Patriot. After Abiah Franklin left the most recent classroom she visited, students could be seen peering out the window on the lookout for a possible time machine awaiting her departure. You see, learning is always a bit more fun . . . when a piece of history walks right into the classroom! Is Dead Air Deadly in Web Conferencing?